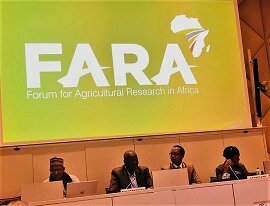 The Programme of Accompanying Research for Agricultural Innovation (PARI) funded by the Government of Germany, in close partnership with the Forum for Agricultural Research in Africa (FARA) commenced the bottom-up innovation contest with the aim of identifying and documenting innovation in its 12 pilot countries. This came following the successful implementation of the contests in Ethiopia, Kenya, Malawi and Zambia in 2016 with the program commencing competition in Cameroon Republic, in April 2017. Scoping Meeting at Ngaoundere, Adamawa Region of Cameroon, 27 April 2017. From 23rd to 29th April, the farmer innovation contest implementation team of FARA, in collaboration with the Institute of Agricultural Research for Development (IRAD) of Cameroon, organised a scoping, planning and budgeting visit across South-Western, Western, North Western and Adamawa Regions of Cameroon. Discussions were held with agricultural research, extension and innovation partners of the regions, viz: Green Innovation Centres (GIC) of GIZ, Cameroon Radio and Television (CRTV), Ministry of Agriculture and Rural Development (MINADER), Ministry of Fishery and Livestock Industries (MINEPIA), and NGOs – the philosophy behind and the process of the farmer innovation contest, and the contributions expected from each partner. Scoping Meeting at Ekona, South-Western Region of Cameroon, 25 April 2017. Scoping Meeting at Baffoussam, Western Region of Cameroon, 26 April 2017. Further, the team appreciated the scope of the selected regions and collected necessary information for planning and budgeting of innovation contest activities such as training, advertisement, scouting, pre-screening and evaluation of applications, awarding of best innovators, and documentation. In all, the scoping farmer innovation contest team learnt that the selected regions are large (in area and population), diversified agro-ecologically and culturally, and promising in terms innovativeness of farmers. Innovation is key to the development of Africa’s agriculture. The conventional research system in Africa relied mostly on the knowledge, technologies and inventions generated by the scientists. Such technologies are passed down to the farmers through the extension systems without any recourse to the utility of the technologies and its developmental impact. Apparently, most technologies generated and disseminated using this mode hardly fit into the producers’ condition and are faced with poor to non-adoption. However, African farmers continue to produce and feed the teeming population; while the aggregate productivity remains very low. Some outliers exist within the producer’s population and such are enjoying high productivity and income. These categories of farmers represent the positive deviance in the population and are characterised by their innovative capacity. They have generated different innovations that give them an edge in their production and livelihood. Most of these innovations are hardly shared with others and somewhat remain an advantage to limited individuals around the innovator. Getting the different innovation from these categories of stakeholders to benefit wider groups and the sector at large is the key goal of the innovation contest. Innovation with commercial benefits is hardly shared by the innovator for a few reasons; (1) the need to be rewarded for the innovation and (2) the need for acknowledgement of the source of the innovation. To ensure that the innovations are shared, a process to woo farmers to share their innovations was developed. This process provides rewards, acknowledgement and honour to innovators, incentivizing the innovators to share their technologies and allowing it to be refined and disseminated for the benefit of others. The process is tagged “the Farmers or bottom-up Innovation contest”. It involves the creation of a competition, where innovative farmers and other stakeholders come up with their different innovations to compete for an award. In the process, the farmers provide information on their innovations and all identified innovations are evaluated and graded for award of prizes. This method has been used by a few organizations and projects in recent past.